I wish I could say that things are back to normal but I confess I have no idea what that looks like anymore. Things seems to change at a pretty fast clip here lately and I feel like I am spinning in circles most of the time. Thank goodness for stitching or I think I might be in the loony bin! I spent the first 2 weeks in NOVA babysitting for my granddaughter as planned. It was a wonderful time and I am so glad I was able to spend those precious days with her. But the day I was to leave for home for a brief respite, they found a sitter near their home that they all seemed comfortable with and my return wasn't necessary. I had mixed feelings about that. I was not looking forward to the drive back and forth each week for the next few months. DC traffic is horrific no matter when you try to tackle it! Leaving town anytime after 3pm is always a nightmare and there's no guarantee the weekend will be any better. But I was really looking forward to spending that time with the baby. My attachment certainly grew although I'm not sure she recognizes me when I see her now. I really miss her and wish we lived closer so I could see her more often. But have no fear, things did not go back to normal when I returned. The Hubs and I have been talking about moving for some time now. We love it here in Williamsburg and I really love my house but we have been discussing the future need to move into something with the master on the main floor. Both of us suffer from knee issues and climbing up and down the stairs has become a real pain! We both agreed that this would be our last move (stop me if you've heard that before!) so my list of requirements for a new house looked like an episode of Love It or List It! It was going to have to be just about perfect for me to move and that started with the location. I didn't have to be in my same neighborhood but I wanted to be on my current side of town. I have been monitoring my Zillow feed for several years now and nothing fit the bill. So, we decided we needed to look at new construction. Luckily, there is a lot of that around here. So, now we are building a new home and trying to get our current house ready to put on the market. Reserve my room in the loony bin now please!! So I have been going through my house by day and watching baseball and stitching at night. Trying to stay sane although I must confess The Hubs took me away to the beach for a few days to keep the meltdowns to a minimum. We are ex-military and they always packed and moved us. I didn't realize until now what a gift that was!! Having to handle every single thing you own and make a decision about its future is exhausting!! I will be so happy when this part is over!! I was so unhappy with the difference in the picture and the real thing that I spent a lot of time trying to 'fix' it. In the end, I just used all the called for threads and fabric and in the end I really liked it. And so did she! 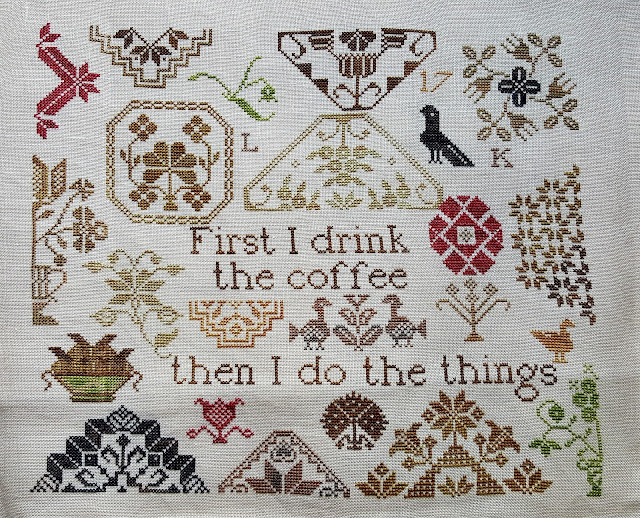 I have also finished a Facebook SAL of Heartstring Samplery's Coffee Quaker. 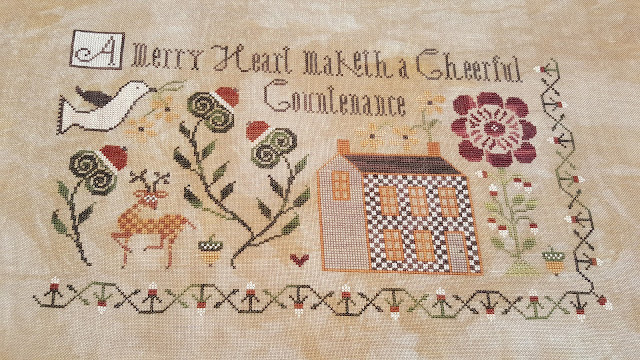 I always love a good Quaker and I enjoyed stitching this so much. I only changed out 1 color ( shocking, I know) to accommodate the color of the fabric. I did, however, take a few liberties with color placement. That red flower looking thing isn't supposed to be red! I am currently working on a loose rotation of several things that include a birth sampler for the princess, 3 Things by Moira Blackburn, and a Scarlett House piece that will be a birthday gift later in the year. Pictures to follow in my next post. I hope to be able to get on a more regular schedule with my poor neglected blog but who can say what will happen next?! I will do my best, that's all I can promise. Laura, it was good to see your post this evening. I have been thinking about you and wondering how the commute to and from NoVA was going for you. What gorgeous pieces you have shared! I have the Coffee Quaker piece and it is slowly moving up in the pile as I see finished ones. Best wishes and good luck on packing up the house! When will you new place be ready? Enjoy the rest of your weekend. Coffee Quaker and Merry heart are both so pretty. I hope life calms down for you soon. Love your finishes--and feel your pain. We're also looking for something on one floor after living in the same place for over 25 years. We have a lot to go through before we can move, so I know exactly what you're up against. Great finishes. I have neglected my blog a bit too. It is hard when life gets in the way. Good luck with your house project. Our room is upstairs and since we moved here we both have "new" knees! Glad you could eke out time to post! Love the finishes, Merry Heart is a favorite of mine. Good luck with the moving; you never know just how much 'stuff' you have until you move somewhere else! Have a good week. I didn't realize you lived in Williamsburg--one of my very favorite destinations. I almost went to William and Mary, in fact! But, in the end, decided it was just too far from home. Lovely stitching--so glad you have it to keep your sanity! Oh no, ankle sprains are no fun. Fingers crossed the DIL gets that job. Sounds like the perfect situation. Take care. Hi Laura! You know, I really miss your blogposts. I am almost finished with A Merry Hart but it's been a WIP since last Fall. I'm sure by now your house is built and your granddaughter is a toddler. I keep you in my blog roll and hope that some day, you'll return! Hope everything's well. I'm going to read your entire blog from the beginning again. 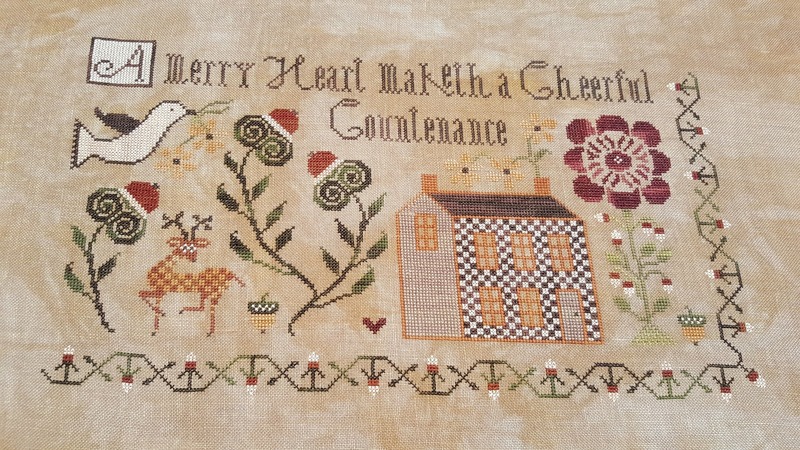 In today's social media with samplers getting very popular, it's nice to see all the samplers you stitched. Take care. I appreciate your comments, they make me smile! I am back after a long absence. More Progress on Gentle Stitches and Kittens! My name is Laura and I live in Wmsburg VA. I've been married for 30+ years, have 2 grown sons, 2 cat children and I'm still the only girl living in my house!! I love needlework, especially samplers, and I find the older I get, the higher the fabric count seems to climb and the brighter the colors get!